What the Difference Between English and Regular Cucumbers? You may think a cucumber is just a cucumber, right? But, in reality, there are actually close to 100 varieties of cucumbers grown in the world, most of which the average consumer does not find. Cucumbers are actually members of the gourd family and grow on creeping vines. Originally native to south Asia, they're now cultivated in most parts of the world. The most commonly found varieties at most markets are the English cucumbers, pickling cucumbers and the regular slicer cucumber we use most often in our dishes. English cucumbers, sometimes called seedless or hothouse cucumbers, are often longer and wrapped in plastic. While these varieties are similar in appearance, there are differences which make them unique in the way they are prepared and consumed. Read on to discover these differences, and decide which cucumber will be the better addition to your next meal. The skin is waxy and the tough dark green color is more uniform. The taste can be more bitter. Generally less expensive to purchase. For a less bitter flavor, the skin and seeds should be removed. Well known names like Kirby and Persian cucumbers are types of slicers. Although any variety of cucumber can be pickled (in a solution or brine of sugar, vinegar and spices), these cucumbers are especially grown to be uniform in width and length. Picklers tend to be shorter and thicker than slicers. They may have a bumpy or spotted skin. Their color, prior to pickling, can vary from yellow to pale or dark green. Gherkins, also known as cornichons or baby dills, are one of the best known varieties of pickling cucumbers. 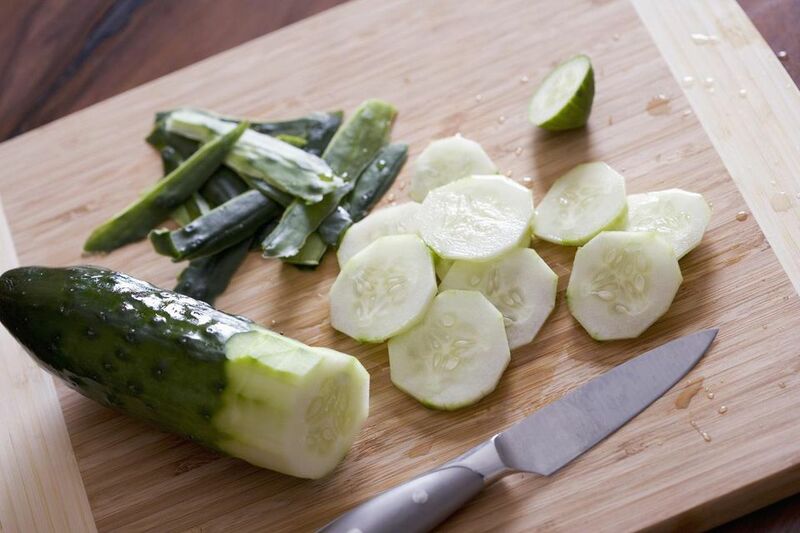 They're typically much shorter than slicing cucumbers with very bumpy skins and are pickled whole, not sliced. These are longer and more narrow than Slicer cucumbers. Most of the time they are not waxed and, instead, wrapped in plastic. Their seeds are much smaller and easier to eat so they do not require de-seeding. The taste is less bitter than slicers, milder and almost sweet. The skin is thinner and edible. Whatever cucumber you choose for your salads is really based on personal preference. If you're peeling, de-seeding and dicing your cucumber, chances are any slicer variety will work for you. But if you're serving whole slices, the extra cost for an English cucumber might be worth it since neither peeling nor de-seeding will be needed. Some people like a lot of seeds; other prefer few seeds. Both taste great and are a crispy, refreshing addition to any salad or meal. What Makes an English Cucumber Different?